Note: Deli closes 1 hour before store closes. 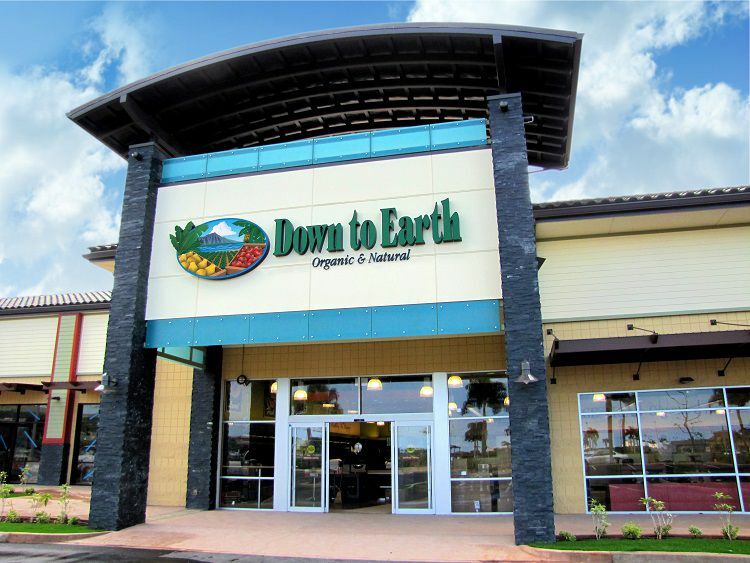 Store front of Down to Earth Kapolei. Four lanes for fast check-out. Most of our produce is local and organic! Over 60 items to choose from! You'll find vegetarian versions of all-time classic favorites from American, Filipino, Asian, Mexican, Indian and Italian cooking as well as other international cuisines. The salad bar offers everyday favorites such as homemade coleslaw and potato salad and unusual items such as nutritious curry quinoa salad and rainbow kale salad, mock-chicken tofu salad, Okinawa sweet potato salad, tofu-nori wraps, and house-made dressings. Made-to order burgers, sandwiches, and wraps, smoothies, juices, organic espresso coffee, and more!. Chill and Frozen foods for just about every taste. Relax in one of our indoor dining areas. Plenty of shade to enjoy outdoor dining. The Kapolei store is located just up the street from Wet and Wild Hawaii water park. It carries a wide range of natural and organic foods and groceries including dairy products and local fresh organic produce. It also has bulk foods, which allow customers to purchase the amount they want and save unnecessary packaging and marketing costs on a wide variety of beans, grains and flours, cereals, candies, and more. They have body care products and truly green household items and the most complete range of all-vegetarian and natural, vitamins, supplements, herbs, and homeopathic remedies available in Hawaii. To find out more about Down to Earth stores check out our departments. There is ample free parking all around the store.